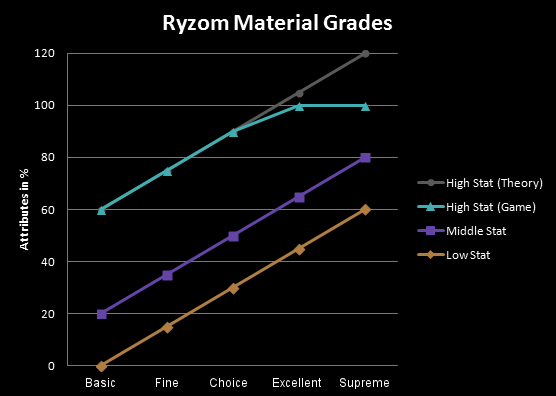 I'm writing several posts on Ryzom crafting, this one will be about available materials and their grades. 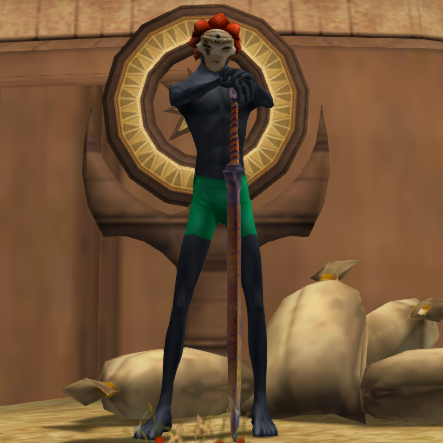 Alot of information can already be found over at the Wiki (link), I try to fill some blind spots and have a more detailed look at the topic. Feel free to discuss the article in this thread, point out errors etc. Sum up the given numbers and divide the sum by their count. Example: 8 + 5 + 17 = 30, now divide 30 by 3 to get an average of 10. These values also determine the prefix of a crafted item. If you calculate the average value of the stats a crafted item displays in the preview and compare it to the chart above, you can determine the item's prefix. If your average value is above the average for the grade, the prefix will be that of the next higher grade. For example, if your average is between 51 and 65, the prefix will be Excellent. If it's at 50 it will be Choice. This seems to work for most cases, but there have been some exceptions to the rule due to rounding or other issues. All raw materials follow certain rules on how their stats are structured. There is always one value higher than all the others and two values lower than all others. The remaining values are between those extremes and equal in numbers. They represent the material average and match its grade. If we take the above theory and apply it to an Excellent material, we end up with a high stat value of 65 + 40 = 105. For a Supreme material it is even 80 + 40 = 120! 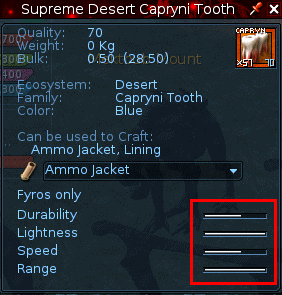 However all materials are limited to values between 0 and 100, so those are simply cut off ingame... Is this a problem? Yes, unfortunatelly it is. If we calculate the averages with these new values, the highs and lows don’t cancel each other out anymore. The average of the material is lower than it was supposed to be, the material is deformed. It has 7 stats: 1x high at 100, 2x low at 60 and the rest of its values at the grade average for supreme, which is 80. Let’s calculate the average of the material with the cut off values in mind. (1x 100 + 2x 60 + 4x 80) divided by 7 is 77.1! But it should have been 80 according to the theory. The Material is 3% worse than it was supposed to be! 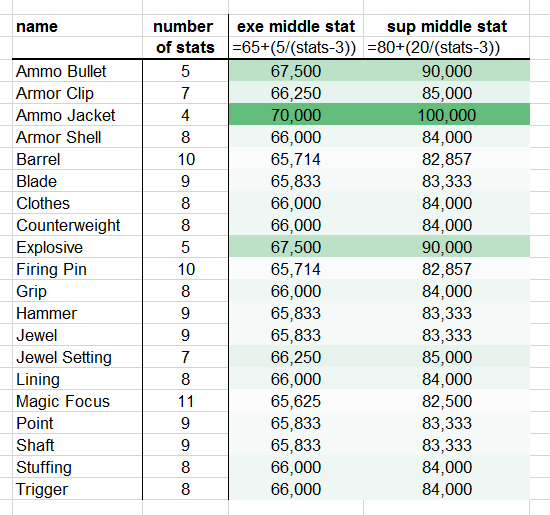 To correct this, the values of the middle stats have been changed ingame from 80 to 85. (1x 100 + 2x 60 + 4x 85) divided by 7 is 80. Voila! The correction amount needed for the middle stats depends on the total number of stats a material has. Let’s look at both extremes in the following paragraphs, Ammo Jacket with 4 stats and Magic Focus with 11 stats. (1x 100 + 2x 60 + 1x 80) divided by 4 is 75. Whoops. (1x 100 + 2x 60 + 1x 100) divided by 4 is 80. Perfect! The material appears to have two high stats now, but in reality it is just one high stat and a middle stat, which has been adjusted to make up for the wrong average. (1x 100 + 2x 60 + 8x 80) divided by 11 is 78.2. Close! This is the closest we can get towards the ideal average. It needs the smallest correction amount from 80 to 82. (1x 100 + 2x 60 + 8x 82) divided by 11 is 79.6. If it was 83, it would be above 80. The same principle applies to Excellent materials, the range for the middle stat in this case is 65 to 70. Why is this important? Because once Excellent and Supreme materials are used, the ideal averages for the grades don’t match with the game anymore. The averages are an important factor for the values in the craft preview window so it is good to keep this in mind. Very nicely done! Thanks for taking the time to write this. all of these are nicely done arc, i'll be adding them to the cookies reference post that's linked in my signature. My old image hoster died and all images went dark. Hosting the images myself now, should fix the problem. Let's see if I get this..
Best is capped to 100 so the normal value should be like best's nerfed/normal mat count = 1 (oh, exactly 1) higher. 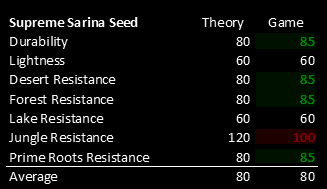 and rest = 80+(20/5) = 84? I ment only material's values, not crafting yet. What I mean, the highest is always the 60/75/90/100/100 and lowest always 0/15/30/45/60(? ), but would the normal stats be something like this?